Do I HAVE to EXERCISE??? Happy Monday Everyone! It’s Day 9 of our 30 day challenge & the answer to this question is an unequivocal yes!!! If the truth be told you can’t afford not to exercise. With the rise in healthcare costs the cheaper option is to make your investment up front in healthy foods, time spent exercising, gym memberships, personal trainers, exercise DVDs, FitBit devices (Surge, Charge etc…). I have to push through the temptation and the excuses not to exercise everyday! It is a fight for your life, literally. 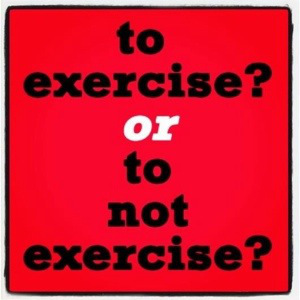 Exercise is anywhere between 20-30% of what aids in weight loss & your food intake/sleep is the other 70-80%. All 3 elements are key in you seeing lasting results. Right now I am on vacation and I promise you the last thing that I want to do is exercise BUT if I want to keep from gaining weight while on vacation I’ve got to get it in at the gym or outside. Saturday and Sunday I did a walk/run on the beach and it was a great workout, sweat and all. I plan to get in some swimming today and more walk/running on the beach. I have to give props to my husband for challenging me to do that. I believe having a workout partner is essential to helping you stay motivated to exercise daily but they have to be in it to win it too!!! When you have days like this where you are questioning whether you should exercise let your answer be an uncompromising yes and get added motivation from someone who can hold you accountable with your exercising. This person could be someone who also wants to lose weight or get fit or someone who has already traveled down the path you are now on. That person is key to your success so take full advantage of the support that person can provide! Take the time to secure your accountability partner today! So now there are truly No Excuses! We have 21 days left on our challenge!!! Previous Post Are You Motivated To Lose Weight? If Not Read This! Next Post 1st Weigh In For August 2015!